The island of Phuket in southern Thailand is home to a number of world-class resorts — although few could match the dramatic elements of the clifftop Paresa Resort, whose water features are among the most stunning to be found in a hotel anywhere. 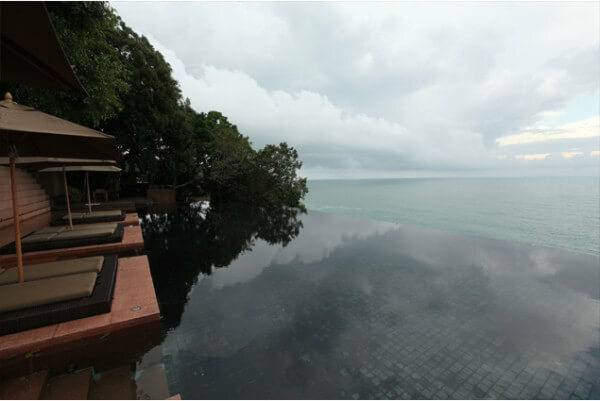 Outdoors, the shimmering infinity pool overlooks the seemingly endless Andaman Sea. 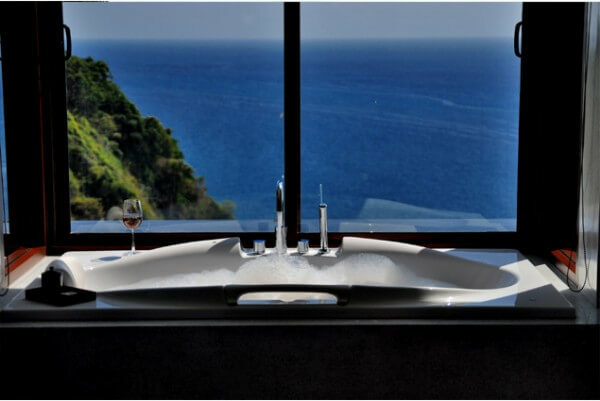 Indoors, the villas and suites — all with sea views — boast sumptuous washrooms highlighting spacious tubs with vistas through plate glass windows or reached via stepping stones surrounded by rivulets of water. Paresa, which translates from the Sanskrit to “Heaven of Heavens,” radiates romance: from the guest rooms’ private entrances and semi-secluded balconies (most with private pools) to super-wide poolside daybeds, and from the unique bathtub settings to the tables for two on the sunny terrace overlooking the sparkling sea. The rooms themselves feature king-sized beds that are bathed in sunlight during the day but can enveloped in darkness at night. Understated elegance permeates the resort through design motifs that are classically Southern Thai, as reflected by the lavish use of rich local teak wood. Traditional batik works of art complement the regional and Chinese furnishings that appoint the premises, while the bathrooms’ white Italian terrazzo tiles enhance the overall sense of unpretentious luxury. Unstinting service is another Paresa hallmark. Wi-Fi is complimentary throughout the resort. Amiable chauffeurs transport guests in electric carts up and down the paved cliffside paths to the two onsite restaurants, the fitness facilities, the sauna, the main pool and the spa’s five treatment suites. There is also a daily shuttle to nearby Kamala Beach, one of the island’s finest, and evening home to the popular Phuket Fantasea cultural performance. The nightlife and bustle of Patong Beach is only 10 minutes further along the new road. The dining options at Paresa live up to the resort’s overall high standards. Diavolo is the Western-style restaurant, where the delicious buffet breakfast, along with choice of a la carte dish, is served. The emphasis at lunch and dinner is on Italian cuisine, which can be enjoyed with a bottle of fine wine from the resort’s glass wine cellar, one of the best collections on the island. Paresa’s signature restaurant is Talung Thai, whose menu offers not only the more familiar examples of the nation’s culinary heritage but also specialties of the house influenced by the local flavors of the country’s south. Mouthwatering desserts can be ordered from either the Talung Thai or Diavolo listings, and the entire meal savored in the spectacular setting of a 270-degree ocean view. Published rates: THB 14, 987.00 – THB 36,386.00 (approx. $485.00 – $1,180.00), Rates for the Grand Villa on request. Text by Buzzy Gordon, who was hosted by the Thailand Tourism Authority. Photos courtesy of Paresa Resorts.